I greatly enjoyed this new Frontiers in Neuroscience paper by Hickok and colleagues called “Partially overlapping sensorimotor networks underlie speech praxis and verbal short-term memory: Evidence from apraxia of speech following acute stroke”. These researchers evaluated 76 patients during the acute phase of their stroke using behavioral and MRI measures. They found a strong relationship between apraxia (AOS) and verbal short- term memory (vSTM) difficulties as well as weak relationships between aphasia and AOS and vSTM upon behavioral testing. For patients with AOS, the MRIs revealed tissue damage along a sensorimotor network of motor-related areas and sensory-related areas. The motor related areas that were implicated were as follows: primary motor cortex (proposed site of motor programs for opening and closing vocal tract gestures that correspond roughly to consonant and vowel phonemes); pars opercularis (a part of Broca’s area involved in phonological processing and suppression of response tendencies); premotor cortex (planning and sequencing of speech units and sensory guidance of movement; motor programs for syllables); and insula (specialized for motor planning of speech). The sensory-related areas associated with AOS were primary somatosensory cortex (site of somatosensory targets for speech); secondary somatosensory cortex (sensorimotor integration); parietal operculum (sensory motor interface for speech); and auditory cortex (processing of auditory information; auditory targets for speech). The areas associated with vSTM deficits overlapped those associated with AOS but only in the motor-related areas, specifically pars opercularis and par triangularis (i.e., Broca’s area), premotor cortex and primary motor cortex. With regard to the network associated with AOS, the authors concluded that the findings demonstrate “that the targets for speech are sensory in nature” and that “motor control generally and speech motor control specifically is dependent on sensorimotor integration”. I found these conclusions to be interesting in view of our interventions studies with children who have childhood apraxia of speech. As I reported in a previous blog, we are having success with an approach in which we encourage strengthening of both articulatory-phonetic and acoustic-phonetic representations for target words and the connections between them. With regard to vSTM, the authors indicate that “the involvement of motor areas is predicted as vSTM involves an articulatory rehearsal component”. They seem surprised however that “posterior, sensory related regions” were not implicated in this study as correlates of the hypothesized “storage” component in short-term memory. This finding reminded me of a paper I wrote in 2008 in which I pointed out that children’s nonword repetition performance, supposedly a measure of vSTM, factors with speech production accuracy rather than language ability in large scale studies involving children with either typical or atypical language development. I interpreted these findings in relation to a connectionist model of working memory proposed by MacDonald and Christensen (2002). According to this model there is no short term memory store per se because working memory is not differentiated from linguistic knowledge and processing. Individual differences in working memory task performance reflect differences in precision of phonological representations and processing efficiency due to experiential and biological factors. The processes and representations involved in working memory are the same as those used in speech planning. Many of the children that we are working with have difficulty planning an utterance – I have described these children with phonological planning difficulties in a previous blog. The children have difficulty with consistent repetition of nonwords and complex real words. The successful intervention for these children involves providing multimodal external cues to support the child’s efforts to construct and execute a plan to produce new words, as described in a previous blog. It is important that the SLP avoid providing an auditory model for imitation by the child however although the SLP may imitate the child’s production to reinforce successful attempts or correct failed attempts. Hickok et al interpret their findings in light of their hierarchical model although I remain uncertain about this notion of a hierarchical organization of these components just because I can never quite sort out what ‘higher” versus “lower” means when placing these kinds of components in a hierarchical relationship. The importance of acquiring knowledge of different forms of linguistic representation – acoustic, articulatory, phonological and semantic – and linking across multiple representations to achieve functional goals has implications for typical and atypical language development however. I have been writing about the children in our intervention study for children with Childhood Apraxia of Speech (CAS). So far about half of the children referred to us appear to have difficulties in the domain of phonological memory with their overt phenotype corresponding to the subtype described by Dorothy Bishop Dodd as Inconsistent Deviant Disorder. Shriberg et al. (2012) have developed the Syllable Repetition Task as one means of identifying deficits in “memory processes that store and retrieve [phonemic, sublexical, and lexical] representations. We have been using this SRT test to differentiate children who have deficits in phonological planning versus motor planning. I described the profile that corresponds to difficulties with motor planning (transcoding) in a previous post. Today I will discuss the phonological memory or phonological planning profile that we see in approximately half of the children that are referred to us with suspected CAS. These children can be identified by a qualitative analysis of their SRT performance and by their performance on the Inconsistency Test of the DEAP. Starting with the SRT, one child in our study for example was able to achieve 12/18 consonants correct when imitating 2-syllable items but only 5/18 consonants correct when imitating 3-syllable items, thus exemplifying the classic profile of a child with phonological memory difficulties – better nonword repetition performance for short versus long items. Qualitatively he tended toward consonant harmony errors even with some 2-syllable items, /bama/=[mama], /maba/=[mama], and then more frequently with the 3-syllable items, /nabada/=[mamada]. Addition of syllables and vowel errors also occurred, /manaba/ = [mamadada], /manabada/=[mimadama]. Poor maintenance of phonotactic structure and vowel errors were also observed on the Inconsistency Test, “helicopter” = [hokopapɚ], “elephant”= [ɛmpɩnt], which yielded an overall inconsistency score of 78% as many words were produced with multiple variants, e.g., “butterfly”= [bʌtfaɩ], [bʌtwaɩ], [bʌtətwaɩ]. The most striking illustration of the difficulties these children have with the storage and retrieval of phonological representations comes during our treatment sessions however. In this research program we are teaching the children nonsense words in meaningful contexts. For example in one scenario we teach the children the names of “alien flowers” and in one of the treatment conditions we use graphic stimuli, paired with gestural cues if necessary, to represent the syllables and phonemes in the words and phrases that we are teaching. Many of the children in our study learn all of the nonsense words without difficulty (5 words per goal/condition introduced over 6 45-minute sessions). However children with the phonological memory difficulties have great difficulty learning the words (SLP: This is a speet. Say speet. Child: speet. That’s right, speet. What is it? Child: I don’t know. 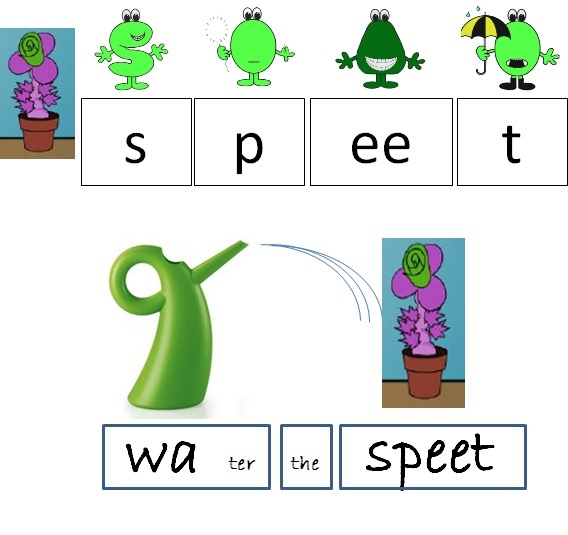 SLP: Yes, you do it’s speet, the purple one, the purple one is speet, remember, say speet. Child: ‘speet’. SLP, you’ve got it, the purple flower is speet, it’s a speet, what is it, it’s a … Child: um, I don’t know, and so on). The most effective intervention to use with these children closely mirrors the procedures described by Barbara Dodd as the “core vocabulary” approach and demonstrated by Sharon Crosbie in the video that accompanies their chapter in the Williams, McLeod and McCauley (2010) book. The video is lovely and shows how to use graphic stimuli and a chaining procedure to teach the child to produce a word consistently – the idea is to encourage the child to develop and implement their own phonological/motor plan rather than relying on an imitative model. The children respond to this technique really well and will learn to say the new words such as “speet” and “stoon” quickly and accurately. The trouble begins when our student SLPs want the children to use the new words spontaneously in phrases (e.g., “water the speet”). They have great difficulty remembering the word or even the carrier phrase without the imitative model and I have to work really hard to teach the student clinicians to withhold the imitative model in favour of using other cues to stimulate spontaneous production of the target words and phrases (SLP: What is it? Let’s start with the snake sound here…). We have wonderful video of student SLPs learning these techniques as well as children achieving their goals. Tanya Matthews and I will be presenting them at ASHA 2014. The difference in the way that you implement therapy with these children is subtle but important. I am pretty sure that Case Study 8-4 in our book had a phonological planning deficit rather than the motor planning disorder that he was treated for. I can’t help but think that if he was treated with these techniques he might have made some progress in the three years that we followed his case (whereas he made literally no progress at all until he was treated with a synthetic phonics approach in second grade). I’d love to hear from you if you have any other ideas about how best to treat children with phonological memory problems and inconsistent deviant disorder. In March 2013 I described the research we are conducting in my lab to identify individual differences in response to two different approaches to the treatment of Childhood Apraxia of Speech. I also described the unique single subject randomization design that we are using and presented some data for one child without revealing the interventions that corresponded to the condition that worked best for this particular child. We have subsequently replicated this result with another child so today I am going to write about the features of the intervention that children with difficulties in the area of transcoding appear to benefit from most clearly. Recall that transcoding is revealed in part by addition errors on the Syllable Repetition Task. In the case of the child profiled in the previous blog, he added nasal consonants at syllable boundaries when asked to repeat the syllable strings and he was just as likely to do this for short strings as for long, e.g., “mada” → [bᴂndə] and “manabada” → [mandabad]. This child also had difficulty with multisyllable repetition during the maximum performance tests but no difficulty with the single syllable diadochokinetic rate. Within word inconsistency was borderline with inconsistent word productions largely reflecting single feature errors (voicing errors for example). Altogether the impression is of a true apraxia or motor planning disorder (as opposed to a phonological planning deficit, a more common problem that I will describe in a future post). Thus far we have assessed 18 children in this study and remarkably only 3 have presented with this particular profile. Two of these children have shown the best response to an intervention that is directed at promoting auditory-motor integration. It includes input-oriented procedures that are described in Chapter 9 of my book combined with output-oriented procedures described in Chapter 10. The procedures are used to promote the consistent use of stimulable phonemes in the context of word shapes that are difficult for the child so that the focus is more on holistic movement patterns at the whole word level than on individual phonemes. In the case described here we taught novel “monster names” that had a strong-weak-strong stress pattern and word internal coda consonants such as “Biftenope” and “Hapnidreem” and assessed for carry-over to phrases with similar structures (pumpkin pie, bat mobile). One reason that we designed an intervention approach that focused on auditory-motor integration is that there is evidence from the animal literature suggesting that this might be a foundational problem in the case of apraxia. Kurt, Fisher and Ehret examined sensory-motor association learning in mice with two different FoxP2 mutations. The task involved learning to avoid electronic shock by leaping a hurdle (or not) to the other compartment of a box in response to varied tones that signaled the location of the shock. Mice with either mutation were impaired in their response, one more severe that the other, in comparison to wild-type mice that learned the task without difficulty. The second reason that we designed an intervention with an auditory-motor integration component is that the ability to modify motor plans in response to auditory feedback and in relation to an auditory target is theoretically essential to the acquisition of speech motor control. So what does an intervention that focuses on auditory-motor integration look like? Not surprisingly it has procedures that focus attention on the auditory-perceptual aspects of speech as well as procedures that focus on motor practice, none of the procedures themselves being novel or surprising. During the prepractice portion of each treatment we ensured that the child had a good perceptual representation for the target words using auditory bombardment and focused stimulation in meaningful contexts as well as error detection tasks as described in my teaching blog (scroll down to week 22). We also taught the child to monitor his own speech and respond differentially to his own correct or incorrect productions of the target words. For example an appropriate activity might be for the child “call” the monster and to then place the monster in his sleeping bag in the tent if he heard himself produce the name correctly or to place the monster in an alternative sleeping bag out in the rain if he heard himself produce the name incorrectly (our students are endlessly creative and this variation on the game has proved to be popular with the children this year). The practice part of the session, for the most part, proceeds as one would expect for any child with CAS, focusing on high intensity practice while the SLP provides just enough stimulation prior to each attempt to elicit a correct response more often than not. However, every effort is made to avoid providing too much feedback. Working in blocks of five trials each, summative knowledge of results is provided whenever possible – this means that the child is given an opportunity to evaluate his own responses in relation to his own auditory goal without interference from SLP input, and then compare his own judgment with the SLPs count of correct responses at the end of each 5 trial run. Edy Strand writes about the importance of giving the child time to integrate feedback in her chapter with Derbertine in Caruso and Strand (1999) and describes precisely how to do this. Given a high rate of responses (over 100 trials per 20 minute practice session) and an average of 70% correct responses, this child was able to make excellent progress as measured by both same day and next day probes (see green bars on his chart here). A second child with the same profile also showed a significant benefit in favour of this approach. A third child is still being treated and it will be some time before we will know if he completes the protocol and then many more months before blind coding of his results will be finished. But, we are hopeful! I have just read this marvelous paper tweeted out by @vaughanbell: Stafford, T., & Dewar, M. (2013). Tracing the Trajectory of Skill Learning With a Very Large Sample of Online Game Players. Psychological Science. He was impressed by the very large sample size (N = 854,064) but I am impressed by the relevance of this paper for speech therapy. The researchers used “detailed records of practice activity from an on-line game” and used it to test hypotheses about learning in the game which requires “rapid perceptual decision making and motor responses”. Gratifyingly for us as speech-language pathologists, the results confirm the principles of motor learning that are currently promoted for successful treatment of childhood apraxia of speech (CAS), specifically practice intensity, distributed practice and variable practice conditions (for application of these principles to the treatment of apraxia of speech see for example Gildersleeve-Neuman in the ASHA Leader or Tricia McCabe’s ReST program). There was one concept raised in the paper that was a little bit novel with respect to the CAS literature however: specifically, the authors talk about the “exploration/exploitation” dilemma. In the context of this simple but bizarrely fun computer game (found here at The Welcome Collection) you can explore the axon growing environment when first learning to play or you can settle into a strategy of simply clicking on the closest protein in your circle of influence. The latter strategy will work to grow your axon which is the object of the game but you will miss out on learning how to maneuver your circle of influence so as to actively find the “power proteins” that advance the growth of your axon. Exploration has a cost in that it leads to more variable performance early on but the benefit is potentially better performance with longer experience. In fact, Stafford et al. observed a close relationship between higher early variance in performance and better performance during later attempts. This trade-off between exploration and exploitation reminded me of the importance of the expansion stage in early speech development and the implications for intervention with young children with CAS. I often talk to SLPs who are frustrated by failed efforts to teach new phones via imitation to children with severe speech sound disorders. However children with limited vocal repertoires must first be encouraged to freely explore their vocal systems. I describe procedures to encourage vocal play in detail in the book, following Dethorne, Johnson, Walder, and Mahurin-Smith (2009) and supplementing with examples of implementation from my own clinical experience. I hope that Stafford et al.’s interesting research and this amusing little game leads to more reflection about the role of exploration and variability in speech motor learning.